Unlike traditional superconductivity in metals such as lead or aluminum, the unconventional superconductivity in the heavy fermions, cuprates, and at least some of the iron-based superconductors originates by doping a magnetic parent compound. This raises the possibility of carrier-doping-induced quantum phase transitions in these systems arising from competing types of orders. As a result, the extent to which quantum criticality (QC) controls the finite temperature properties of these systems have risen to the forefront in condensed matter physics, thus triggering a substantial research effort devoted to exploring the relationship between superconductivity and magnetism in these systems. While the pioneering work of 1958 by Matthias and coworkers illustrates the antagonistic nature of these two phenomena, research efforts made to understand the unconventional superconductivity have revealed the coexistence of these competing orders in a certain space of the phase diagram of unconventional superconductors. The study of the interplay between magnetism and superconductivity is crucial to understanding the nature of strongly correlated materials and this is, broadly, the focus of research in our group. Heavy-fermion (HF) materials have in recent years emerged as prototypical systems to study quantum criticality, the interaction between magnetism and superconductivity, and to address problems that are central to the broader understanding of strongly correlated quantum matter. They offer a particularly propitious setting for these studies due to their unique properties. First, these materials contain both strongly localized (magnetic) and itinerant (conduction) electrons. Second, strong interactions between them often lead to the competition and coexistence of different phases, such as anti-ferromagnetism, unconventional (non-Fermi liquid) metallic phase, and unconventional superconductivity. Thus a transition from localized to itinerant electron behavior happens across a quantum critical point (QCP) at T = 0 K. Third, their large effective charge-carrier mass is accompanied by small relevant energy scales such that their ground state can be tuned not only by chemical doping, but also by pressure and magnetic fields easily accessible in a typical condensed-matter laboratory. The properties of these materials are primarily governed by two competing interactions, the RKKY interaction favoring a magnetic ground state, and the Kondo interaction favoring a non-magnetic coherent state (see Figure). The 2008 discovery of superconductivity in Fe-based pnictides, with the highest Tc reaching almost 60 K and, more recently, Fe chalcogenites were among the most significant breakthroughs in condensed-matter physics during the past decade. The reason is at least two fold: First, the phase diagram of Fe-based superconductors reveals an intricate interplay between magnetism and superconductivity, also typical of other “exotic” unconventional superconductors discovered in the last three decades of the last millennium: heavy fermions, cuprates, ruthenates, organic superconductors, and molecular superconductors. The research efforts made to understand the unconventional superconductivity in all these materials have revealed the coexistence of these competing orders in a certain space of their phase diagram. 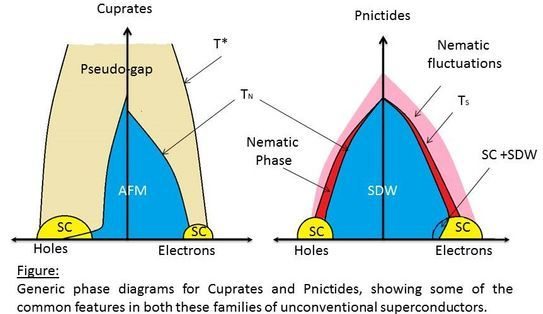 Second, this discovery of Fe-based high Tc superconductors has shown that the cuprates are not a unique class of materials (with the exception of the cuprates, the Tc of all the other unconventional superconductors is quite low) and that there is at least one other alternative to the CuO2 planes as the essential entity for the occurrence of high Tc superconductivity. Despite the tremendous progress made in understanding the physics of the cuprates, they have resisted, for more than 20 years, all attempts to formulate a comprehensive theory explaining all of their properties, in particular their high Tc. 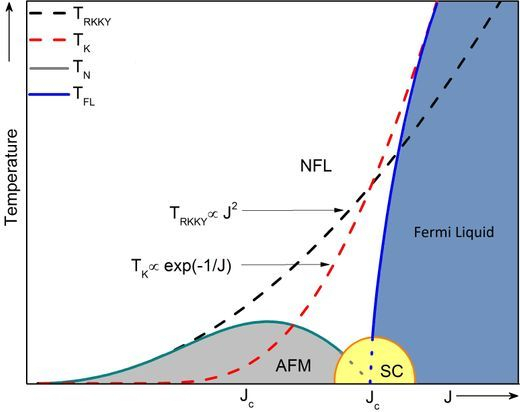 Now, with two species, Fe-pnictides/chalcogenites (FePn/Ch) and cuprates, to compare and contrast, the experiments could finally uncover the vital clues that theorists could use to solve the mystery of high transition temperature superconductivity.